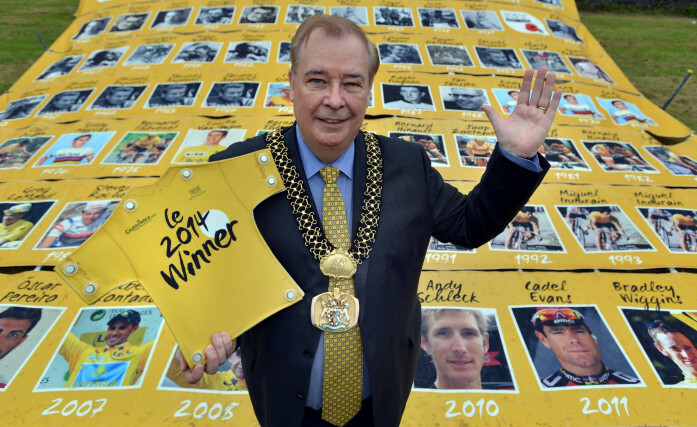 A world record attempt for the largest mosaic print made from recycled materials was unveiled by the Lord Mayor of Bradford, Councillor Mike Gibbons, at the Official Grand Depart Spectator Hub in Ilkley, today. The print aims to raise awareness of the importance of recycling and is made entirely from recycled plastic water bottles. It is estimated that 42,000 bottles of water will be consumed by the Tour de France cycling teams this year and the 8 x 8 metre printed mosaic features the names and faces of all previous tour winners. Whilst recycling plastics is by no means a news; up-cycling into artworks is a genuinely novel and interesting way of adding real value to waste water bottles. The mosaic showcases how innovative recycling and printing techniques can combine to produce environmentally improved products and its creators hope the world record attempt will encourage more companies to specify recycled plastics for their banners and signs. If you want to see the mosaic for yourself, it will be on display at the Riverside Gardens all day tomorrow before heading to Paris for the finale of the race.